For those of you that don’t follow internet marketing, a “Google Slap” is when GOOG suddenly makes a change in the way it treats a site that pays it for advertising. The result is high, HIGH amounts charged to the advertiser. Or they simply quit running your ads altogether. That’s the case with me right now. Don’t get me wrong… I think that Google has a right to decide for whom they will advertise (or NOT) and what they will charge. That’s one of the beauties of a free market and I stand behind it. For “Google” to truly “decide” whether or not RadioActive Trading deserves a place in the search listings… then Google must know whether or not what we say is true. So should you. Here’s the deal: RadioActive Trading is temporarily off-reservation in the Google world (though they have managed to accept tens of thousands of dollars from us in the past) because of a policy of theirs meant to protect the public. Hey Google! I know you are trying to protect the public from being duped. So are we. I wrote The Blueprint in 2002 with the express intent of helping people that had been sucked into the idea of 3-6% monthly returns using covered calls. What I HAVE seen here in the US of A… and in at least thirty countries around the world… is folks that have been able to ‘Bulletproof’ their stock. By buying a put option and using the Income Methods to reduce net cost basis… countless traders have been able to create a situation in which they can win, but can’t lose. But “Bulletproof” and “can’t lose” are terms and phrases that Google seems, at least for now, not to be able to swallow. But what about our readers? Could they possibly be intelligent enough to decide for themselves whether that claim is true? I must warn you, august reader… if you proceed beyond this paragraph and read how I helped a client to Bulletproof his stock… you are NO LONGER under the wisdom, guidance and protection of Google. 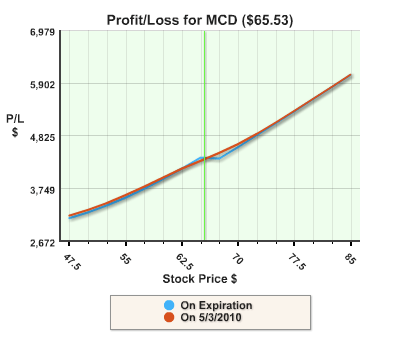 So, I had a fella with shares of MCD that he had at a cost basis of $22.15. 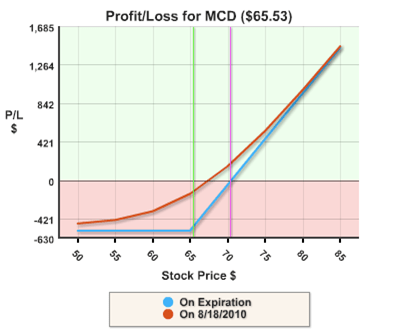 At the time, (early 2010) MCD was trading at over $65 a share. My client had a problem: he WANTED to do income-producing strategies like covered call selling… but did NOT want to cap his upside potential. 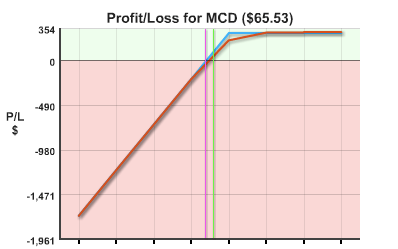 Further… he wanted to continue to collect dividends, but DIDN’T want to see MCD fall below $50 a share. 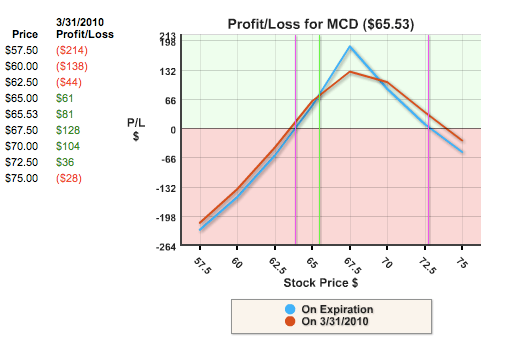 He was nervous that if he sold MCD it would continue up without him, but was also nervous that if he continued to hold MCD it would lose value and cost him money that way. Oh… and did I mention that he liked the idea of insurance, but didn’t like the idea of paying for it? Naw, that caps the upside. Aww, that’s right. You pay for insurance with that one. Pay over and over and you end up with no net profit. Hey, I got it! Let’s buy a put and finance the purchase with a long call! Nope. Now instead of one, there are TWO directions in which I could lose. Ready for the RadioActive Trading Solution? Thought so. Check this out: We bought a far-out in time put option, and actually PAID for the put by selling a near term Bear Call Spread. This particular set of Conditions, Expectations, and Goals on the part of the RadioActive Education client called for a put option plus Income Method #6: A nested, early expiration bear call spread. Receive dividends? We’re long on stock. Need protection? We bought a put option. Was the put insurance affordable? Shucks, the Jan 2011 put was PAID FOR by selling the June 2010 Bear Call Spread. In case you hadn’t thought about this… with protection clear out to Jan 2011, our client could use Income Method #6: a near-term, nested Bear Call Spread SEVERAL times before expiry. Then he might get insurance again! But Kurt… what about being BULLETPROOF… having no more risk but still having that unlimited upside you were talking about? Well, take another look at the graph. It looks suspiciously like long stock… only WITHOUT a break even line. That’s because there isn’t one. You can’t possibly take less out of this position than it cost to put together. Meanwhile, the stock can continue up and bring the owner greater gains! If the Bear Call Spread goes against the user, we’re looking at a GAIN in the stock that more than offsets the buyback cost. Then the long call takes over as MCD continues skyward. In other words, the stock retains unlimited upside potential, while paying our client a dividend AND premiums for consecutive bear call spreads. If the stock absolutely tanks, he gets to exercise the put a stay a winner. If he never exercises the put, that’s fine because it has no net cost basis. BEST part: if MCD wants to keep going up, he doesn’t have to feel like a chump for selling early. We-e-ell… I DO want to keep Google as an advertising venue, so that more folks can learn how to really reach their goals… while staying out of trouble in case the market goes sour. But Google isn’t the only way to get the message out. In fact, I’m willing to bet that after reading THIS message, YOU’LL want to have a second set of eyes on it. If you’re thinking of sending this on… please do! And don’t forget to leave your comments below. Let’s do something new for fun and perhaps profit. 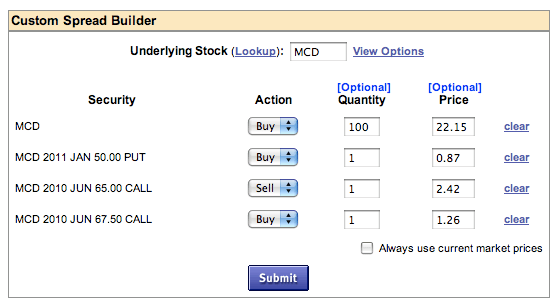 I challenge you to an “options duel”…your RAPM set-ups vs. my Diagonal set-ups. I’ll buy every new position you create in your seminars, and we can compare the results on line as to cost; return; time in trade, etc. i’d like to watch that duel and get educated. already understand the radioactive approach and the “equivalent” option strategies. i’d like to see the “adjustments” to the initial options position, sort of something along the lines of how macmillan would do it maybe trying to adjust delta along the way? i think macmillan also used stock so that both gamma and delta could be neutralized, or was that someone else? Well, sure… but I don’t see the point. If you are bent on showing how to “preserve capital” and trade with less money then we won’t be comparing apples with apples. Take ESRX. I buy the Jan 2012 $60 puts, trading today at $6.65 X $6.80. Say I get filled at the ask and also buy the stock at $56.25. That’s $63.05 for an issue guaranteed to be worth $60, or $3.05 AT RISK. Now you, on the other hand, get ESRX Jan 2012 $60 calls. They are trading at $3.05 X $3.20. If you are also filled at the ask, you will spend $3.20. That’s $3.20 AT RISK. Okay, so now we assume that all I’m doing is what I call Income Method #1: Selling near term calls against the long term stock-put position (there are TEN different Income Methods but I’m not making this any more complex than it seems you want it to be). You are doing a diagonal spread… an ‘equivalent position’ selling near calls against far term calls. Hokay. Two scenarios: One great, the other disastrous. ESRX trades near $60 the whole time. We both sell near term $60 calls in August, November, and January for $1.75 (I’m being generous), collecting $5.25 total in premiums. Your expenditure is $3.20 and you make $5.25 in premiums. That’s $2.05 profit on a $3.20 investment: ASTOUNDING. That’s about 64%. Meanwhile, I bring in $5.75 also, set against my $63.05 purchase. That brings the cost basis down to $57.30. My put guarantees that I sell at expiry for $60, so I get a $2.70 profit. That’s a greater dollar amount but a smaller PERCENT profit because I “have so much invested”. Fair enough. I only make 4.28% on my invested capital of $6305. Now for the nut-cuttin’, as my paw used to say. What about another scenario in which ESRX TANKS after the initial call sold? Say she is trading at $40 overnight… not an impossible or unusual occurence after a bad news item or earnings announcement. Well… I have spent $63.05, reduced of course by the $1.75 collected from the first call sale. That’s $61.30 net spent, and I’m NOT going to be able to sell my stock and put for separate amounts and cash in on the time value remaining. It’s just too far in the money. SO I exercise, getting back my $60 and now have lost $1.30 (remember? $61.30 cost basis, recover only $60 of it) for a total percent lost of 2.06%. You, on the other hand, have invested $3.05… gotten $1.75 of that paid for with the first short call… and cannot get a buyer for your $60 call while your stock is trading at $40 a share. $3.05 minus $1.75 equals the same $1.30 dollar amount that I lost. No surprise there… but does that $1.30 represent the same PERCENT amount lost? Hooo… not by a long shot. $1.30 divided by your initial investment of $3.20 is 40.625%. If all you were playing was $320, now you are down to $190 to play. If you want to say, “Well, I would only do this if I had $10,000, so losing $130 is only 1.3%”… well, okay. But be honest mathematically and base your percent RETURN on the WINNING trade the same way. Instead of claiming a 64% profit you may only claim your $205 won versus the whole $10K: a 2.05% profit. See what I mean about apples versus apples? Sure, you may boast a greater percent win when and if you play a diagonal spread that finishes well. But you must now be honest and acknowledge the greater percent LOSS when it goes against you. $164,000 invested with a 40.6% loss: $96825. Sorry, but it appears that you have come up short. How about the RadioActive Profit Machine? Looks like on the same issue I come out ahead by $2306. Still care to duel? Okay. Let’s do it over several issues and several wins AND losses. Then we’ll compare results. You may make a few bucks but I doubt that it will surpass the RadioActive Profit Machine. You may lose but I’ll bet you lose more than the RadioActive Profit Machine. MM is just thumping his macho chest. Your methods work fine for me. If he wants to, he can start a business just like you did. If his methods are SO MUCH better than yours, he will get the business and you will get none. Somehow, I doubt it. Don’t waste your time on simian rantings … spend your time in continuing to educate. Thanks Rod! Yes, we’ve had more than our share of gunslingers but no one seems to actually be able to stick with any challenge for any fair length of time. I post all winners AND losers and that thins the herd quite a bit. I’ll take your advice and continue with the low-risk mantra 😉 Thanks for the encouragement! You have to frame this article for posterity. If GOOGLE doesn’t get the valuable message, they need to seek help. I’m sure they could have funded it with all the large losses on the investments of their staff (senior management included) that could have been avoided by paying attention. You forgot to mention to them in your article how the savy traders were able to bulletproof even their own (GOOGLE) stock, just like their own staff could have done. Oh well, it’s not too late if they will come to their senses! … or at least research it some before nixing your ads. Guess they’re all just 20-somethings that think they know everything. Do it! We might all learn something. I must be missing something here, because the Investopedia definition of an Option Diagonal Spread says that the maximum loss for a diagaonal call or put credit spread is unlimited. Now, as for own personal preference, I would much rather be slapped by Google than to get mauled by the Martingale. Ha! I would much rather get slapped by GOOG as well, rather than to get mauled by the Martingale. That’s who we’re daring if we buy calls to sell against without any thought about position sizing. I think that what dueling boy was talking about was a simple Calendar Spread, buying a long term call and selling near term calls against. As you know, that’s not what I do exactly but it looked like the challenge was all about that. I THINK that what you’re referring to, the Registered Retirement Account, is a Canadian tax shelter instrument. N’est-ce pas? I have a number of Canadian clients and I believe that at least seven of the ten Income Methods are cleared to be used in an RRA. Weigh with that the fact that my very first edition of The Blueprint only included the FIRST FOUR Income Methods, and it gained international attention even back then. I know for certain that and RRA allows all four of those. I’m not sure on IM#5, IM#7 and IM#8. More important than anything else is the setup, which limits risk to single digit percents. Pick up The Blueprint and speak with your tax advisor, I am sure he will agree that it’s a good investment! In a time of volatile markets, in a time when many are doing their best to invest safely it is interesting GOOG is passing judgement on something they obviously know nothing about. To be able to retire, to be able to live without food stamps, we need safe means of trading and your training on how to do it. I have found the Blueprint to be an excellent resource for SAFE strategies when investing in stocks and options. While no trade starts as “Bullet Proof”, your Blueprint book provides strategies and training to show us the proper way to make a trade BulletProof and take profits in a totally safe way. I have watched friends who are in love with stop loss orders, loose 6 to 8 percent on every trade in a down market. I have watched other friends place puts on stocks they own and make a profit (or minimize losses) on a major down move in the market and then adjust for more profit as the stock climbs back up. Anyone who trades the stock market knows you can no longer trust “Buy and Hold” to make you wealthy and if you are over 50, you know you don’t have the 30 years it may take for the stock to rise back to break even! I wish GOOG would just read the Blueprint and learn a bit before they condemn a great solution and block it from being visible to those who need it. Thanks for the affirmation, Gary! Yes, it’s pretty ironic… the policy to “protect the public” ends up shielding them from exactly the solution they need! Ah well… as I have mentioned before, RadioActive Trading and The Blueprint have done well before Google and they’ll do well after. The buzz created by this article alone has been worth more than all the paid advertising we used in the previous week! I’ll continue doing whatever it takes to get this information to the public. Thanks again for your post. going to be OK with a 15 dollar haircut? ?